Explanation: Unlike most entries in Charles Messier's famous catalog of deep sky objects, M24 is not a bright galaxy, star cluster, or nebula. It's a gap in nearby, obscuring interstellar dust clouds that allows a view of the distant stars in the Sagittarius spiral arm of our Milky Way galaxy. When you gaze at the star cloud with binoculars or small telescope you are looking through a window over 300 light-years wide at stars some 10,000 light-years or more from Earth. Sometimes called the Small Sagittarius Star Cloud, M24's luminous stars fill the left side of this gorgeous starscape. 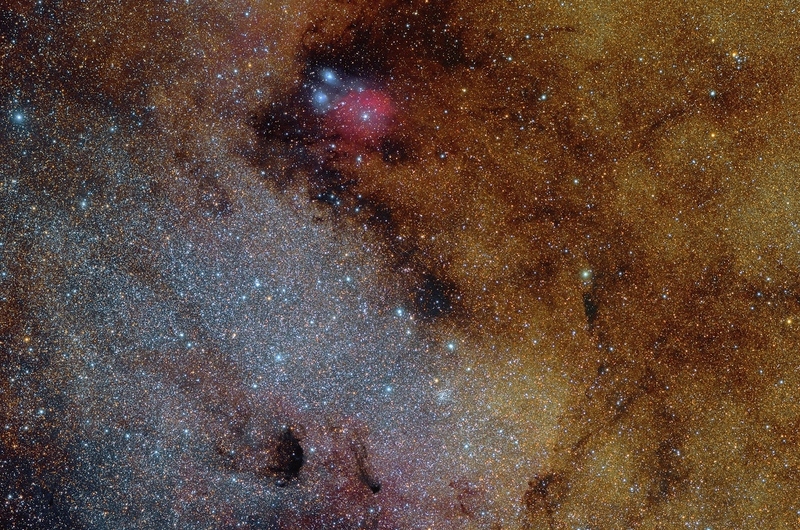 Covering about 4 degrees or the width of 8 full moons in the constellation Sagittarius, the telescopic field of view contains many small, dense clouds of dust and nebulae toward the center of the Milky Way, including reddish emission from IC 1284 near the top of the frame.